Niki Collier’s work in felt has been recognised for its intimate understanding of techniques and her dedication to origin and material in her storytelling. She participates in national and international curated shows and develops solo work through residencies and public commissions. Her work is convergence of science and art and aims to empower through engagement. Delicate robustness, provocative innocence, abundance and vulnerability… Artists were invited to draw inspiration from the paradoxical nature of the dual theme, Monumentality / Fragility, proposed by BeCarft (formerly: the World Crafts Council – Belgique Francophone, WCC-BF) for the 2018 edition of the European Prize for Applied Arts. Niki Collier is one of the 74 selected whom the jury selected out of 600 applicants. 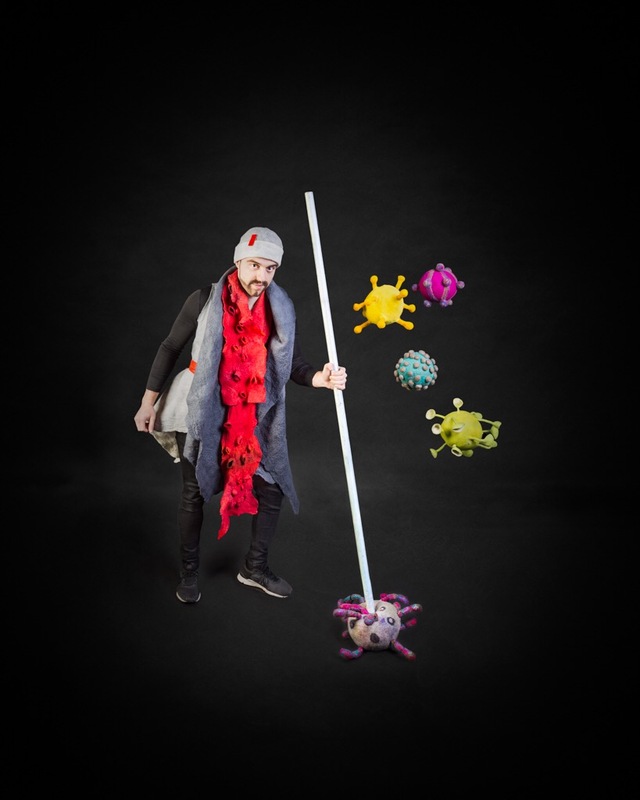 The three felt sculptures: Common Cold, Hepatitis B and Herpes are informed by microscopic photos of viruses. Niki provokes the discourse about the dichotomous relationship between function and form. On one hand the pieces of art you see look cute, colourful and cuddly. On the other the actual organisms could have long term effect on our health, and life. Good looking, but not good to us. Simultaneously, they are a necessary living organism contributing to the overall habitat wellness on earth so the fight against them puts us once again in the position of invader tipping the balance between what suits our tribe and what serves all life forms.